As I’m writing this, I’m watching the snow fall outside my living room picture window. Snow is a rare occurrence here in Georgia, so when it happens it’s a major event. We just aren’t used to it or prepared for much of it, so schools, businesses, and government buildings close when we have wintry weather. You Northerners can make fun of us all you’d like, but we’d rather be safe than sorry around here. I know I’m a bit odd, but I love the snow. Maybe I wouldn’t if we had more of it, but to me it’s a beautiful reminder of God’s creativity and it helps us to take notice of the magnificence of His creation more than usual. We are forced to slow down when it snows. We stay home and spend time with our loved ones while the roads are dangerous. We build snowmen and drink hot chocolate. I adore it. When the weather forecast calls for snow a day or two ahead, it’s almost like Christmas is coming. I braved the grocery stores yesterday (not because we needed milk and bread, but because I didn’t want to miss the sales if I couldn’t make it out before they ended). You would’ve thought it was Black Friday. Traffic was unbelievably heavy around our town, and you couldn’t stir people with a stick inside the stores. Everyone was stocking up in case they were stranded at home for a couple of weeks–I mean days. One benefit of being a stockpiling couponer is that my family is all set for a snow-in. Bring it on! Except that I get antsy after being stuck at home for two or three days and by that time I’m ready for a thaw. So, it’s a good thing I live in Georgia and our winter storms are usually short lived. I was helping my 6th grader do some research about snowflakes this morning (yes, homeschoolers still have school even when it snows). 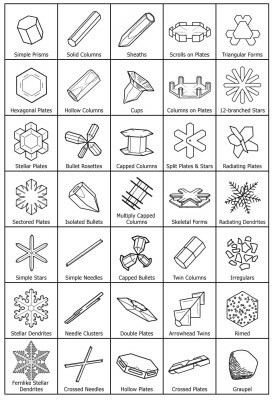 Did you know that there are over 35 different types of snowflakes, according to SnowCrystals.com’s “Guide to Snowflakes”?! Pretty amazing stuff, right? What strikes me is that these shapes don’t happen just by chance. They aren’t simply blobs of ice stuck together; they have definite geometrical patterns and shapes. They are amazingly intricate and uniquely beautiful. If God takes that much care in designing each different snowflake, just think of how carefully He crafts you and me. HE DOESN’T MAKE MISTAKES. I wonder sometimes about God’s purpose in making me. I have many, many faults; I struggle with paralyzing fears. I know I disappoint Him, just like I disappoint my loved ones here on earth. I’m not perfect, by any means. Thank you, Lord, for snow. This entry was posted in Christianity and tagged Christianity, Debt-Free Living in a Debt-Filled World, encouragement, Jesus, stewardship. Bookmark the permalink.